Your risk capital in intraday trading is what you can afford to lose. In fact, if you trade in futures and options, you can lose more than what you have invested. Intraday trading is a high risk strategy and therefore your investment in intraday trading should be such that, even if you were to lose all money it will not hurt your overall financial situation. The rule of thumb is that, you should not allocate more than 5% of your total equity investment to intraday trading. On the other hand, remember that day trading profits are made on small price movements (from 0.5% to 2%). Therefore, unless you trade in substantial volumes, you will not be able to make meaningful profits. To trade in substantial volumes, you need to have a minimum risk capital base. What is the minimum risk capital base? It really depends on how much profits you expect to make. As a general guidance, Rs 2 Lakhs is seen as the minimum risk capital base for intraday trading. At the same time, as discussed earlier, you should ensure that the risk capital is a small portion (less than 5%) of your equity investment corpus. Do not indulge in intraday trading, unless you can afford to. You should be able to devote sufficient time to intraday trading, from the opening bell at 9am to closing bell at 3:30pm every day. You should be able to monitor what is going on in the market and with your scrips, almost on a minute to minute basis. If you have a full time job or business that requires most of your attention during market hours, then intraday trading is not for you. For example, you may buy shares at Rs 100 at 10am in the morning for intraday trading and then get on with your job or other business till 2pm. Meanwhile the scrip may have gone up to Rs 110 by 11am and then fallen to Rs 90 at 2pm, by the time you return to your trading activity. So, even though, you could have made a profit of Rs 10, you end up making a loss of Rs 10, simply because you were not around. A way to avoid this situation is to place limit orders, if you are away from the market for some time. However, limit order is not really the most effective intraday trading strategy. It may be possible to be a day trader, without being glued to the screen a 100% of the times during market hours but you need to have access to market data at any point of time to be a day trader. However, if you are in a full time job and at the same time checking share prices every 5 minutes on your PC or tablet or phone, you will not be able to do justice to either your job or your trades. You need to educate yourself about trading. Knowledge of technical analysis is very important in intraday trading. Technical analysis is the methodology for forecasting the trend of share prices through the study of historical market data, primarily price and volume. Some retail investors trade using support and resistance levels that are given by websites if the traders key in the high, low and closing prices. In many cases, these support and resistance levels are just pivot points. The pivot point levels are an old school indicator that calculates support and resistance levels for the current trading period, based on recent prices. However, pivot points are only directional indicators and may easily be breached, resulting in losses for the day traders who trade simply based on pivot points. There can be many support and resistance levels for a scrip. It is important to understand the strengths of these support or resistance levels, and for that you need to have a robust knowledge of technical analysis. Since technical analysis is a very complex topic, you should also follow, what technical experts are saying about levels. Apart from technical analysis, you need to have a good understanding of the futures and options (F&O) market, even if you do not trade in derivatives. Analysis of the F&O data, like futures premium, call and put options open interest, options premium, volatility, future roll-over etc, will help you understand what is happening and what is likely to happen, both in the cash and the derivatives market. Further, you should keep yourself updated about all the upcoming events (like results declaration, dividends declaration, rights issue, bonus, stock splits, mergers and acquisitions etc.) at least for the scrips that you regularly trade in. 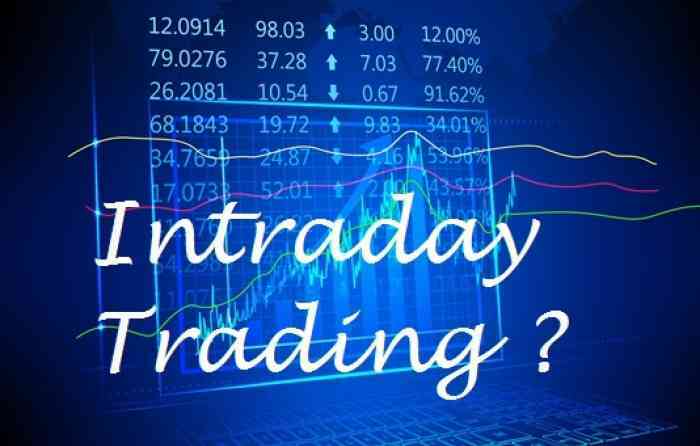 You should ask yourself, if you have the requisite knowledge for intraday trading, based on what we discussed above. Even if you do not have the requisite knowledge, will you be able to invest the time to educate yourself and keep yourself updated? You need to have a trading scheme or plan for intraday trading. Most amateur day traders trade intuitively, instinctively and often impulsively. Professional day traders, on the other hand, trade according to a plan. That is how, professional traders profit from the mistakes of amateur traders. Before you buy, you should fix your entry price and target level. Your psychology should not interfere with your trading plan. Some retail day traders move in too quickly to sell if they are making a profit, and lose the opportunity to fully gain from the upside. While you should not book profits too early, let not greed take over if the target price is met very easily, say within a few minutes of initiating the trade. You should book profits when the target is met. Sometimes. There may be situations, where you may have genuine reasons to feel bullish even if the target price has been exceeded. In that case, you should reset your stop loss (we will discuss stop loss later) so that can make some profits even if the updated target is not met. For example, you bought shares at Rs 100 with a target of Rs 110 and a stop loss of Rs 95. Let us say, the share moves to Rs 110 within 10 minutes of the trade and you feel there is further upside to Rs 120. You may continue with your position, till the share price hits Rs 120, but make sure that you update your stop loss to Rs 107. That way, even if the share moves the other way, after crossing Rs 110, you will still get a profit of Rs 7 on your trade. You should stick to your trading plan and not let fear or greed come in the way. You have to be extremely disciplined for intraday trading. The key to success in intraday trading is a having a stop loss plan, and more importantly implementing on the stop loss plan. You can implement a stop loss, by placing a stop loss order, at the same when you initiate a trade. A stop loss is a trigger for selling shares if the price moves beyond a specified limit. Suppose you buy shares of at Rs 100 and set a stop loss at Rs 95. When the price falls to Rs 95, the shares will be sold automatically. This means you have limited your loss to Rs 5. However, implementing stop losses is not as easy as it sounds. The biggest obstacle to implementing stop losses is our emotion. We do not like losses. If we are making losses, we think that, if we hold on to our positions a little bit longer, prices will recover. While this is one of the most common mistake retail investors make, they often make a bigger mistake. They buy additional shares at a lower price, to average the purchase price. What they do not realize is that, if a stock is on a downward trend, then it will move further downwards. Trying to average will only result in bigger losses. You have to be disciplined in intraday trading. A stop loss order takes the emotions out of the decision to sell. It limits your losses so that you can, proverbially, live to fight another day. Without stop losses, you run the risk of eroding your risk capital substantially if the market crashes. There is also a psychological aspect in intraday trading. No one can predict how markets will behave. Intraday trading can be highly stressful. In a stressed-out state of mind, you will become re-active rather than pro-active. In this state of mind, your ability to follow your trading plan, if you have one in the first place, will be impaired. Even if you are normally, a confident person, a string of losses over few consecutive days, can have an adverse impact on your mental state. This in turn, can have an impact on your interactions with your family and friends, and in some cases, may even have an impact on your health, especially if you pre-existing medical conditions like diabetes, high blood pressure, asthma etc. Day traders should lead a very healthy lifestyle, in order to cope with the high stress. In fact, many professional day traders train in the same way as top sportsman and athletes do, to manage stress. In this article, we have discussed some fundamental success factors critical for intraday trading. You should evaluate for yourself, if intraday trading is the right strategy for you in light of the factors discussed above. You should realize that, some of the factors, discussed in this article, are easier said than done. As discussed earlier, day trading is not right for everyone. In fact, it is not suitable for most people. However, if you are passionate about intraday trading, have sufficient risk capital, the experience & expertise and most importantly, the trading discipline, there is no reason, why you cannot be a successful intraday trader.